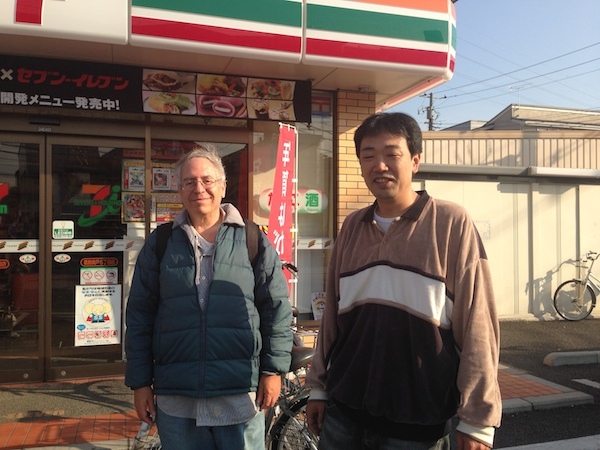 After my usual bicycle ride I stopped at a 7-11 on the way home to use the ATM and get some edamame. Since my errand at 7-11 is only a couple of minutes, and since I always park my bike right in front of the door, I don’t bother to lock it. When I came out though, my bike had been stolen! What a great way to commemorate the 30th anniversary of coming to Japan, I thought. Sigh. So I reported the theft to the manager. They happen to record the front and so we went in back to look at the security video. It shows me arriving at 1:27 pm, and somebody else arriving on another bike a couple of minutes later. The other person goes in and buys cigarettes, leaves the store, and at 1:31 casually gets on my bike and drives away! The thief’s bike was a real cruddy old bike, and didn’t look anything like mine, so we guessed he was a regular bike thief and took the opportunity to upgrade, and we called the police. A policeman came a short while later and got really into all the details of the heist, and took a report. The other bike had some old registration numbers and he took them down and radioed them in to look up. My guess was that it was somebody else’s stolen bike. The guy who had just come says, “That other bike is my older brother’s bike! We share bikes. He must have accidentally gotten on your bike, thinking he had taken my bike.” The first bike looked nothing like my bike, but this guy’s bike was exactly the same except for the color. So while the policeman is still copying down information this guy calls his brother, and sure enough he had ridden off on the wrong bike thinking he had taken the bike he shares with his brother. Meanwhile everybody is amazed. What are the chances that the guy who took my bike’s brother would come to the same 7-11 just while the police were there taking the report? In the middle of all this, the repairman who came to fix a plumbing problem at my house last week came by and asked what happened, and everybody is talking about the big event and it’s becoming a gab fest. Finally the guy’s older brother returns with my bike and apologizes profusely, and the policeman is furiously writing down everybody’s names, addresses and phone numbers. Here is a photo of me with the “bike thief.” You can barely see both our bicycles behind us. The policeman didn’t want to be in the photo, but he took the picture. What a great story Doug…and with a happy ending!! My bike was stolen last month. Outside my house. And locked up. Was this in Brighton? Did the police come? Yup, in Brighton. Think the police are dealing with “real” crime instead. I did fill out a form on the police website and got a nice reply. This is not an “only in the UK matter.” The husband of one of my Tokyo friends saw the security videotape of a man (not of foreign appearance) stealing his bicycle from the parking rack in a corner of the entrance area to their apartment building. They never got it back.